Sinding-Larsen Johansson syndrome (SLJS) is named after Norwegian physician Christian Magnus Falsen Sinding-Larsen (1866-1930) and Swedish surgeon Sven Christian Johansson (1880-1959). It is a common cause of knee pain in adolescents. SLJS is caused by increased tension and pressure due to repetitive pulling by the patellar tendon causing inflammation on the lower part of the patellar (kneecap) and can cause inflammation, avulsion fractures and excess bone growth. It also often occurs in both knees but can occur in only one knee. Sinding-Larsen Johansson syndrome is usually seen in patients between 10-14 years of age but most commonly in males who are active in sports such as football, running, volleyball or gymnastics. It is believed that it is due to forceful contraction of the front muscles in the thigh (quadriceps femoris) against resistance. There is also an increased risk in children with cerebral palsy (a disorder that affects muscle tone, movement and coordination and is usually caused by brain damage that occurred before or during childbirth) also have an increased risk of having this condition as they have muscle spasms. 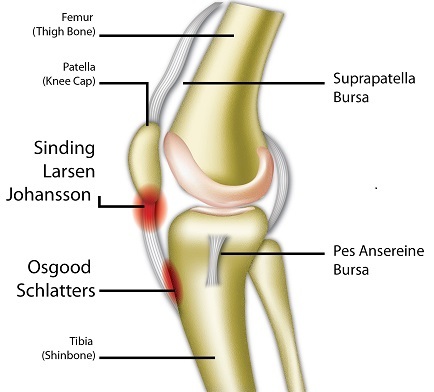 Patients with Sinding-Larsen Johansson syndrome usually have pain on the lower part of the kneecap which increases when the patient bends his/her knee. There may also be some localised swelling near the lower part of the kneecap. Symptoms are aggravated by jumping or putting direct pressure on the lower part of the kneecap. SLJS can be diagnosed via patient history, examination of the knee and imaging such as X-rays and MRI that is also used to rule out other conditions. An ultrasound can also be used to confirm the diagnosis by looking for cartilage swelling, thickening of the tendon, fragmentation of the knee cap and inflammation of the bursa. Ultrasound images can be as effective or more effective than x-rays as it is better in the evaluation of the soft tissues (e.g. tendons and muscles) compared to X-rays. It is also suitable in for follow-up during the disease. It should be considered as the examination of choice as there are no side effects and would, therefore be well-accepted by all parents. The aim of the initial treatment for Sinding-Larsen Johansson syndrome is to provide pain relief by encouraging rest, analgesics and strengthening exercises with activity modification. Patients should refrain from participating in sports and other activity for at least 1-2 months, particularly football and running and it may be replaced by other activities such as swimming or other activities that requires less of the front muscles in the thigh (quadriceps femoris). In severe cases, a cast may be used to maintain immobility. Patients usually have a spontaneous recovery with little complications. If there are any associated problems such as fractures that could have occurred with the onset of the disease, surgery may be needed. It is important to distinguish Sinding-Larsen Johansson syndrome from Osgood-Schlatter disease as they are very similar and both conditions can occur simultaneously. SLJS(Sinding-Larsen Johansson syndrome) involves osteochondrosis (a group of disorders that affect the growing skeleton due to abnormal growth, injury or overuse) of the patella while Osgood-Schlatter disease involves osteochondrosis of the tibial tuberosity. The only difference is the location of patellar insertions respectively. Both diseases are usually self-limiting and respond well to analgesics and activity modification. SLJS usually recovers fully in 10-12 months and recurrence is rare after skeletal maturity. Valentino M, Quiligotti C, Ruggirello M. Sinding-Larsen-Johansson syndrome: A case report. Journal of Ultrasound. 2012; 15(2):127-129. Kuehnast M, Mahomed N, Mistry B. Sinding-Larsen-Johansson syndrome. South African Journal of Child Health. Robert C, Medlar RC, Dennis Lyne E. Sinding-Larsen-Johansson disease: its etiology and natural history. Journal of Bone & Joint Surgery, American. 1978; 60:1113-1116. Iwamoto J., Takeda T., Sato Y., Matsumoto H. Radiographic abnormalities of the inferior pole of the patella in juvenile athletes. Keio Journal of Medicine. 2009;58(1):50–53.